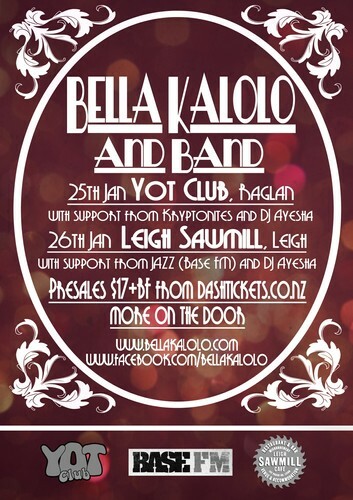 Bella Kalolo is heading north for the summer! Enjoy your Auckland Anniversary Weekend with the best. Fresh from performing in 'Little Shop of Horrors' at Q Theatre in Auckland. Bella is happy to be bringing her own original music on the road for these special gigs. Don't forget to get there early and stay late to hear the sweet tunes being dropped by Jazz (Base FM) and DJ Ayesha.